This is my new Premium AWD with Sunroof. So far I am loving it!!! Also have a 2007 CTS. mrrairai76, mrrairai76, mrrairai76 and 1 others like this. NCHoosier. Nice colors. I like the pin strip. Is it custom? What color is your interior? 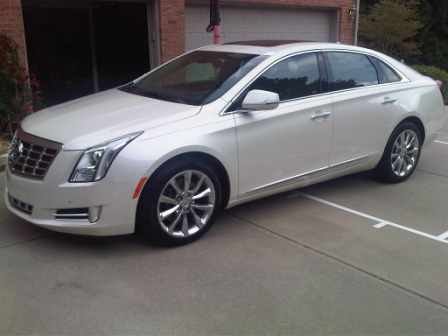 Good luck with your beautiful new XTS. Congratulations @NCHoosier! Very nice. I can't tell from the small pictures, does the pin stripping you can see extend from the rear to the front fender? NCHoosier, congratulations and all the best with your new ride! 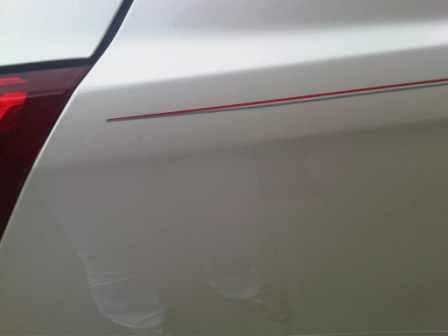 Love the White Diamond and the classy dual color accent striping--very well placed, too! Here are a couple of night shots of SilverFox (Platinum XTS) where I attempted to capture its array of lighting. All pictures are taken with ambient light and while they don't really capture the beauty of what Cadillac has done, if you have not seen an XTS at night it will give you a reasonable approximation. I think you can see the extensive use of LED lights, both soft and defining (on the doors and dash between the wood and the leather) and bright white for entry. You can easily control/set the level of brightness. My guests found the soft defining lighting very nice and quite different than any other car they had been in. rodster111, rodster111, rodster111 and 21 others like this. Thanks for these pictures kipsts! Shows nicely what the effect is of the ambient lighting in a way that's rarely shown. Thanks @rodster111. I appreciate the feedback. It is one great car and I am still learning each time I drive it. Kipsts, you are the best. Sounds very nice @NCHoosier. Is yours a Premium model? Your are too kind @ddawson. Wow kipsts - hot pictures on a hot car! Great pics. Well done. Caddy brochures couldn't have done better.